David Weekly-Castle Hills!Interior corner lot,covered front porch,Crwn moldings,oil rubbed bronze.Custom tile entry,Study,Formal,open Kitchen-enormous island.Kitchen-knotty alder cabinets,2 SS ovens,gas range,pantry & tumbled marble backsplash.Nook-windows 2 backyard & door 2 covered patio.Main living-fireplace & gas logs.Split Master-walk-in closet&shower with body sprayers&oversized soaking jetted tub.Versatile plan-2 beds up front+shared full bath&extra living-2nd office,homework alcove,could be converted to 4th bedroom. Upstairs-game or media+full bath&walk-out attic storage-could b awesome guest suite or teenage retreat. 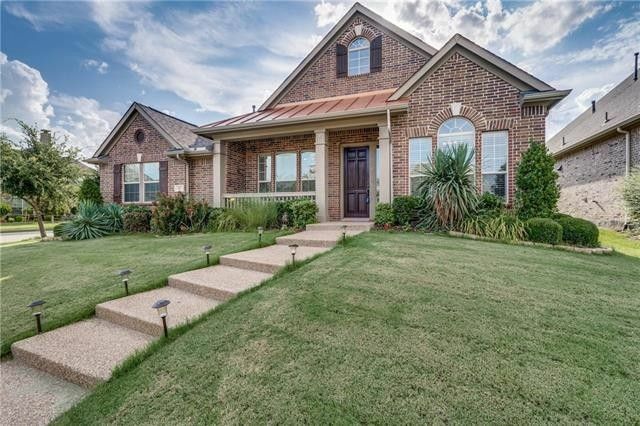 Carpet6.17,Fence6.17,Roof4.17.Close to freeways & DFW airport.Castle Hills Elementary. Directions: From 121, exit Old Denton Road, South to Salisbury Court, Left (east) on Salisbury Court, Left (north) on Water Bridge. House up on on right (east) side of street.